Go West From Missoula, Montana, on Highway 12 into Idaho for a couple of hours. Stop at the Lochsa River, you can't miss it! Go East from Kooskia Idaho to the Lochsa. Pipeline wave is located on the Lochsa river. This wave is a one shot wave, but it is worth getting out of your boat to catch it again. Levels are best in the late spring. Bring a wet suit, if you have one, the water is cold. This wave is an awesome glassy wave in the spring. Excellent location for flatspins when waterlevels. The wave has a funny way of pushing you off. 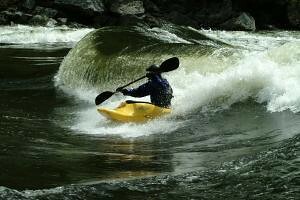 Lochsa is an excellent whitewater experience, and Pipeline is just a great park and play spot. The level this Photo was taken at was 5 feet on the bridge at lowell.